Nakhon Si Thammarat (Thai: , , alternative English transliteration: Nakhon Sri Thammarat from Pali Nagara Sri Dhammaraja) is a city (thesaban nakhon) in southern Thailand, capital of the Nakhon Si Thammarat Province and the Nakhon Si Thammarat District. It is about 610 km (380 mi) south of Bangkok, on the east coast of the Malay Peninsula. 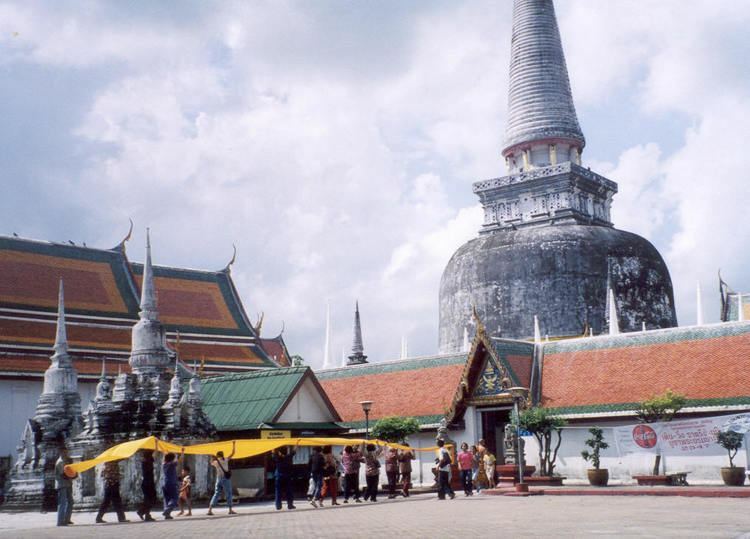 The city was the administrative center of southern Thailand during most of its history. Originally a coastal city, silting moved the coastline away from the city. The city has a much larger north to south extension than west to east, which dates back to its original location on a flood-save dune. The modern city centre on the train station is north of Old Town. As of 2005, the city had a population of 105,417. It is one of the most ancient cities of Thailand, previously the Kingdom of Ligor, and contains many buildings and ruins of historical significance. With the fall of the Siamese capital of Ayutthaya in 1767 it regained independence, but returned to its allegiance on the founding of Bangkok. In the 17th century British, Portuguese, and Dutch merchants set up factories there and carried on an extensive trade. The city of Nakhon Si Thammarat is one of the oldest towns of southern Thailand. Its origins are not fully known. Most historians recognize the Tambralinga Kingdom of Chinese records as a precursor of Nakhon Si Thammarat. The town chronicles of this time are hardly separable from legend, but they do tell of an abandonment and refounding of the town, which would explain the break in history between Tambralinga and Nakhon Si Thammarat. References to a country named Poling appear in Chinese chronicles from the Tang dynasty period down to the early Ming dynasty. Many scholars identify Poling with Maling and Danmaling was one of the member-states of Sanfoqi (the Chinese equivalent to Srivijaya) in the central part of the Malayu Peninsula or today southern Thailand. Poling may also be equated to the Tambralingarat (Tambralinga State) that appears in Indian sources. By the end of the 12th century, Tambralinga had become independent of Srivijaya Kingdom. Its rapid rise to prominence from the 13th century to the beginning of 14th century, Tambralinga had occupied the entire Malay Peninsula and become one of the dominant Southeast Asian states. By the end of the 14th century, Tambralinga had become a part of Siam (now Thailand) named Nakhon Si Thammaraj. At the time of the Sukhothai Kingdom, the Nakhon Si Thammarat Kingdom was already listed as one of the kingdoms under control of the Thai, which it has remained during most of its history. It was usually known as Ligor to European merchants in the 16th century. During the period of the five separate states following the fall of Ayutthaya in 1767, the Prince of Nakhon Si Thammarat made an abortive bid for independence, but was pardoned by Taksin and retired to Thonburi. At the end of the 19th century, the kingdom was finally fully absorbed into Siam by converting it into the Monthon Nakhon Si Thammarat. When the monthon system was abolished in 1932, the town became a provincial capital.